Müpa Budapest offers a new range of gifts in its collection, representing the creative image and the visual elements of the building. Apart form the usual branded personal items, such as umbrellas, postcards, fridge magnets, pencils, erasers, notepads, mugs, mobile phone cases, coasters, badges and ski pass holders, our range also includes designer jewelry made from concrete, as well as designer bags, wallets and jewelry from recycled banners and paper. The assortment of the first 30 products is available in the VINCE bookshop inside the Müpa Budapest building. The range is continuously expanded with CDs and DVDs of various performances, to be sold in the Rózsavölgyi CD store. 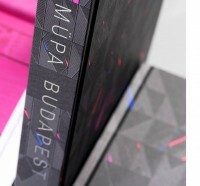 Müpa Budapest has released a publication that is unique even by international standards, documenting the first decade of the institution. The exclusive publication is a series of special historical snapshots, recounting the story of the building’s birth, memorable moments from performances and guest book entries by artists who performed at Müpa Budapest over the years, accompanied by photos, interviews and essays. It serves as a scrapbook for those who participated in the construction of the building, those created the thousands of productions, and of course for the audience. Through the photo-essays, the reader is allowed to take a peek behind the scenes and see how the institution operates and comes to life; see backstage images of artists preparing and entering the stage and how a performance begins. The exclusive publication is also accompanied by 3 CDs that contain excerpts of memorable Müpa Budapest performances, showcasing the most diverse musical genres, with performers such as Laurie Anderson, Avishai Cohen, Joyce DiDonato, Marianne Faithfull, Philippe Herreweghe, Félix Lajkó, László Polgár, Sir Simon Rattle, Béla Szakcsi Lakatos or Ramón Vargas. The book is available to buy at the Vince Bookstore located in the Müpa Budapest building or at the Libri stores, at a price of HUF 9,900. 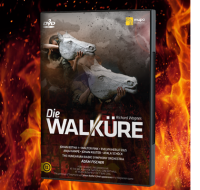 For the first time in the history of Müpa Budapest, those looking to take home the magical experience of the "Budapest Wagner Days" Opera Festival can now do so, as the recording of the 17 June 2016 performance of The Valkyrie is now out on DVD. The second part of the "Budapest Wagner Days" Opera Festival’s hugely successful Ring tetralogy featured world-renowned singers such as Anja Kampe, Evelyn Herlitzius and Walter Fink. Sadly, this also proved to be the final Wagner role played by Johan Botha, who passed away shortly after the production. The performance was conducted by Ádám Fischer, artistic director for "Wagner in Budapest”. The 3-disk German-language recording features subtitles in Hungarian, English and German. The release is available for purchase in Müpa Budapest or on Szervita Square, in the Rózsavölgyi shops.